I love this time of year. I love the warm, sunny days and the cool, perfect for sleeping nights. 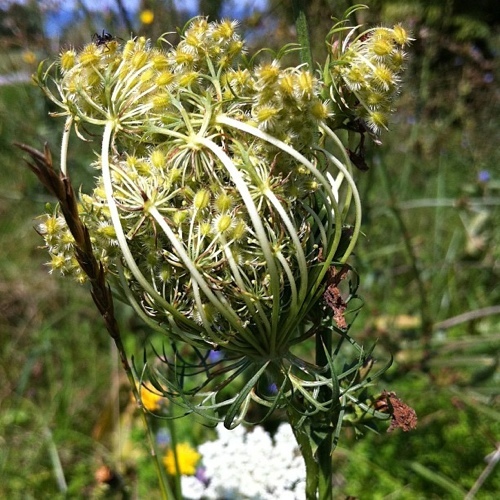 I love the late summer wildflowers overflowing the roadside ditches. I love the monarch butterflies that positively swarm me on my late morning runs. I love that the wooded trails stay cool long into the afternoon. I love the slight sense of urgency one feels during BBQs and camping trips, staying outside just a little longer, trying to squeeze every last drop out of summer before that morning chill starts to hang around a little too long into the day. But most of all, I love the absolute overabundance of fresh produce this time of year. Particularly around here (upstate NY, aka the Arctic) where the growing season is too short and I feel like I spend most of my year trying to figure out another way to prepare squash, potatoes, and onions and reminding myself that while the tomatoes on the shelves might look pretty good I’m going to be sorely disappointed if I try to eat one. I don’t think I fully appreciated the unbelievable bounty of the growing season during my years in California. I lived in the central valley after all, and there were always fresh fruits and veggies of some sort available from the local farms. The worst dilemma I had to contend with was during that in-between season for garlic when the new crop had yet to be cured and the old crop had run out so I had to make do with green garlic from the co-op or (gasp!) go to the regular grocery store! Here, however, there is a much more distinct (and brief) season for fresh produce, and it has left me nothing short of amazed when it finally comes around. For the past few weeks we have had friends, family, and customers dropping off garden fresh veggies en masse. So much so that I’m actually having trouble using it all before it goes bad. Not the worst problem to have! Odds are, you’re having this same “problem” with bumper crops of tomatoes and zucchini begging to be picked from your garden or showing up on your doorstep from anonymous donors. Although I don’t think I’ll ever truly get sick of eating the usual no-cook summer classics, there are times, especially on these cool late summer nights, when I just want a hot meal. A little comfort food to ease myself into autumn. This simple, one bowl meal takes care of those needs. Roasted tomatoes make a dent in that red and orange pile sitting on your counter, and are distinct enough in their flavor and creamy mouthfeel to be worlds away from those caprese salads and tomato sandwiches you’ve been eating everyday. 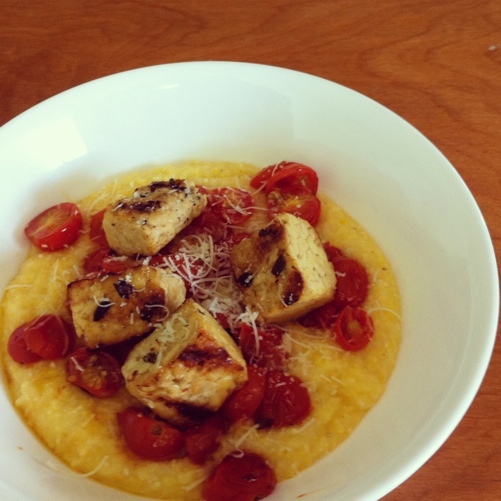 Polenta gives mashed potatoes a run for their money as the ultimate comfort food. Smoky grilled tempeh adds some protein, and fresh herbs liven it all up and remind you that summer isn’t over just yet. Please enjoy this dish as you enjoy the end of the season: savoring what remains while looking forward to the approaching change and all of the adventures it may bring. Since it is still summer, I’ve been cooking everything I can on the grill. If you don’t have a grill, or the weather just isn’t conducive to grilling, this can all easily be cooked indoors. Cook the tempeh on a griddle on the stovetop, or bake it in the oven. I haven’t tried it this way but I would guess baking in a 350 degree oven for about 30 minutes, flipping the tempeh about halfway through should do the trick. 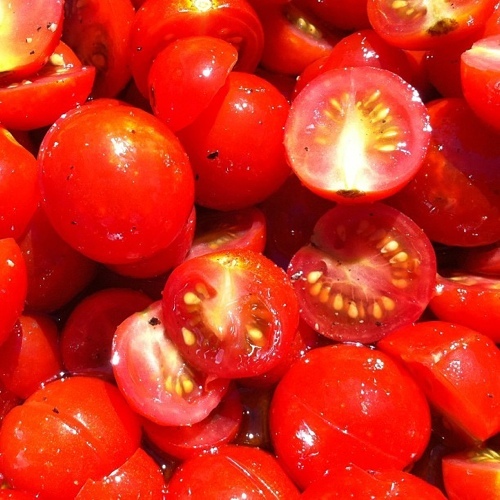 Similarly, the tomatoes can be roasted in the oven at 350 degrees for about 30 minutes. Finally, this recipe can easily be made vegan by leaving out the cheese. If you go this route, I’d recommend adding in a few tablespoons of nutritional yeast to keep a little of that cheesy deliciousness. Cut the tempeh into 1 1/2 inch blocks and steam for 10 minutes. While the tempeh is steaming, mix the remaining grilled tempeh ingredients in a wide, shallow dish. Add the steamed tempeh to the dish, cover, and refrigerate for at least 30 minutes, flipping the blocks once or twice. Preheat the grill to moderate heat (around 350 degrees). Slice the cherry tomatoes in half and put them in a large bowl. Pour the 1/4 c of olive oil over the tomatoes, season with salt and pepper, and toss to coat. Transfer the tomatoes to a foil-lined baking sheet or roasting dish and position the tomatoes so that the cut sides are facing up. Place the baking sheet on the grill and cook for about 20 minutes, or until the tomatoes begin to lose their structure. Remove from the grill and set aside. Bring the water and salt for the polenta to a boil. Slowly pour the polenta into the boiling water in a thin stream, whisking continuously to avoid clumping. Turn down the heat, cover, and allow the polenta to simmer, stirring frequently, until all of the liquid has been absorbed. This could take as little as 10 minutes or as long as 30 minutes, depending on how coarse your polenta is. When the polenta is done, remove it from the heat and stir in the parmesan, reserving a bit for garnish. Taste for salt and add more if necessary. Turn the grill heat up to medium-high. Transfer the tempeh from the marinade to the grill grates. Grill for about 2 minutes on each side. Remove from the grill. To serve, ladle the polenta into bowls. Top with the roasted tomatoes, then the grilled tempeh. Garnish with the reserved parmesan and additional chopped oregano, if desired. Yum and yum! What a recipe! This recipe is very good. I have a blog of Italian recipes but I like to discover new flavours. Thanks, Alberto. I’m so glad you enjoyed it. I love Italian food, so I’ll definitely check out your blog!